When music has no lyrical content, its titles become gnomic and mysterious, intentionally or otherwise. ‘Our Floor With All Its Beliefs’ could be taken in so many different ways, but to be honest I think it’s best not to take it at all. Unless there is a very clear relationship between the musical themes and title it’s safest to assume it’s some kind of private joke or reference, and concentrate on the sound instead: and surely the point of music which refuses, not only verbal language, but the established tropes of musical narrative, is to present itself to the auditory cortex abstractly, as sound, in just the same way that the stone reproduced as the cover of Tone presents itself to the visual cortex. The experience of listening, I suspect, is intended to resemble the experience of seeing such a piece of stone, and touching it with the fingertips; it certainly struck me as analogous. 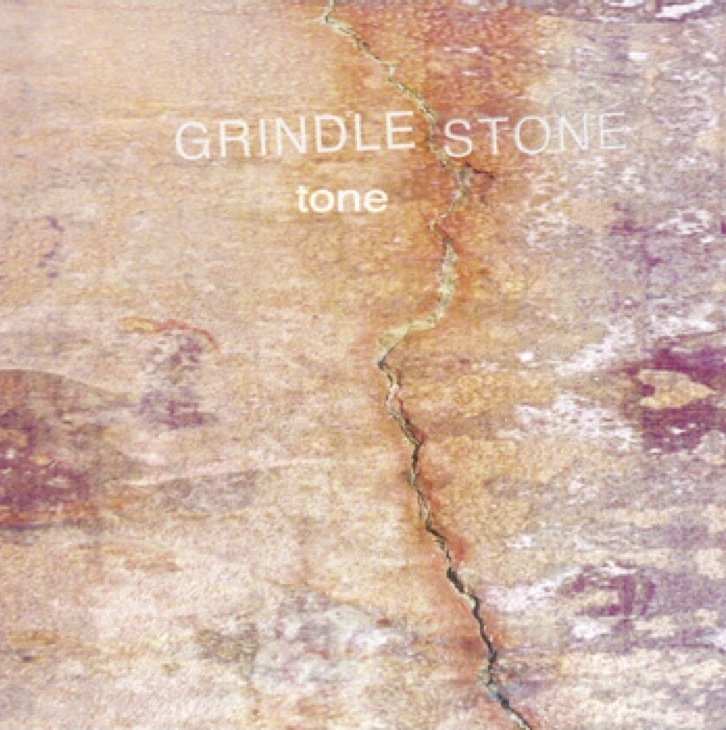 Grindlestone do not use the term ‘field recording’ in relation to this album; that term implies a degree of documentary rigour in the representation of a sound, an assumption that it is harvested whole. These sounds are very much constructed, although in some cases their source is an act of musical performance, and in others it is a ‘found sound’. The degree of mediation involved makes it hard (if not impossible) to identify their origins, and indeed obscures the distinction between the intentionally musical and the aleatory; as the very idea of ambient music confounds, to some extent, the conventional distinction in use value between music and non-music, this seems to reinforce the searching questions that are asked of us, as listeners. The pieces collected on Tone are structures of long notes, extended textures, albeit that some of them are highly granular, or proceed in pulsing judders of attack and release. Some elements are tones, of which some are apparently generated by bowed strings, others synthesised or gathered from the wild; other elements are noise, although very few are harsh or abrasive. They come and go in accretions that build up to, and retreat from, defined maxima of density, outweighing the textures of chamber homophony (for example) but stopping some way short of a stampeding orchestra. Their ebb and flow is pelagic, surrounding and enveloping the listener. ‘Elevator Music In A Silent Hotel’ seems like a microscopic close up of the sounds that inhabit an elevator shaft, as much as it mimics in any obvious way the action or effect of an elevator. ‘Fragments Of Past Sounds’ is haunted by the human voice, but the element that resembles a voice is firmly the other side of the comprehensibility horizon, and could plausibly be the singing of tensile elements in a mechanical structure (but then, it occurs to me, isn’t that what the human voice is anyway? ); as the piece develops the sound mutates, and its vocal qualities recede. ‘Of Enough Importance To Fear’ drops small sounds into a hugely reverberant, bassy space, a vast gap between equally vast masses, like the central shaft of the Death Star, or the canyons of Ridley Scott’s dystopian Los Angeles. There is sometimes a specific warmth, a harmonic richness to these sounds, but their ambience is that of a cold and somewhat threatening space, it seems to me. There is something of a rusted, urban pastoral about this music; it resembles the night noises of a somnolent industrial cityscape. This is not ‘heavy’ or disturbing music, but its atmospheres are clearly both unsettled and unsettling. It is assembled with a meticulous attention to the interactions between its elements, its various layers often painstakingly equalised so that, even at its points of maximum density, the music is sonically open, orderly and comprehensible. These sounds are mixed in stereo, but the resulting spaces are convincingly three dimensional, locating the listener as a subject within the soundworld rather than an external observer. Clearly the consequence of a thoroughly considered creative agenda, realised with intelligence and expertise, Grindlestone’s aesthetic is a fairly desolate one, but it is an aesthetic in the conventional sense; there is beauty here.